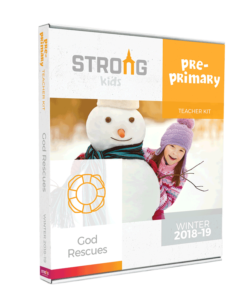 Strong Curriculum is a brand new Sunday School curriculum from RBP. They are happy to introduce this exciting new STRONG KIDS material. The giveaway on this post has ended and the winner was notified by email. Regular Baptist Press firmly believes God’s Word is living and powerful and more effective than any idea or philosophy man could ever dream up. The Bible is Spirit empowered, so it cannot fail to strengthen kids who interact with its truths. Believing this, we purposefully built Strong Kids on Bible bedrock. We know the curriculum’s solid Biblical foundation will make it transformational. Coming up with a comprehensive plan to teach the Bible systematically and completely is not easy. We did the heavy lifting to build the plan so you can use it to focus on communicating God’s Word and strengthening the kids under your care. The Strong Kids comprehensive curriculum plan means you can share God’s Word with confidence. We built the Strong Kids scope and sequence on the seven teaching aims Jesus had during His earthly ministry. Identifying Jesus’ aims helps you teach the Bible with purpose and clear goals in sight. Every lesson in the Strong Kids scope and sequence addresses at least one of Jesus’ teaching aims. Each Strong Kids age group has a special emphasis that contributes to the overall purpose of spiritually strengthening kids. Why? First, there are far too many crucial lessons in the Bible to have all five children’s age groups covering the same Bible passage on the same Sunday. Too many of those important lessons would be left untaught. Second, the age groups’ needs are too varied to force them to cover the exact same scope and sequence every curriculum cycle. Strong Kids for pre-primary, primary, middler, and junior age groups all track along a similar chronological path through the Bible. By design, all four age groups end year 1 with Judges and year 2 with Revelation. This provides continuity as the students move from one age group to the next, and gives them four opportunities to work through the Bible over an eight-year span. How do you know if Strong Kids curriculum is working? You measure your students against the Bible’s standard for spiritual maturity. Strong Kids provides measuring tools that point out your kids’ areas of strengths and weaknesses. The curriculum also gives supplemental ideas for reinforcing the seven teaching aims so you can strengthen areas of weakness. The measuring tools make spirituality practical. They describe what it looks likes to live out Christ’s seven aims. The measuring tools provide a natural connection between the classroom and the home. Parents understand the changes and growth they should be seeing and encouraging in their children’s lives. Heaven is an important emphasis in Strong Kids curriculum. The pre-primary through junior age groups learn how the decisions they make today will affect them for eternity. The curriculum directs them to live in light of eternity by living for God rather than for themselves. It gives their lives meaning now so they might count for something in eternity. In eternity, all believers will want nothing more than to glorify God. How kids live now will determine their capacity to glorify God forever in Heaven. I would love to avail of the trial free gift, I’m a pastors wife and my heart is for the young people, children and the youth. I need materials that will be relevant for them is this present time and a material that is user friendly and yes I find your resources very easy to use. God continue to use you in His kingdom. More power! This looks awesome. I really like all the visual aids and the fact that music is available as well. Our church is small but we want all our kids to be strong in their faith. Thank you so much for your series on ‘The Walk Lesson’ and ‘Sanctify of Life’. These are great lesson plans. My Sunday School children and the Youths are blessed. Our children are young at church, between the ages of 1 year and 5 years old. They love interactive activities such as colourful pictures. The curriculum sounds excellent especially since it’s based on just learning the Bible but using helpful aids such as pictures to enable that to happen. I am certain our at Elohim Christian Church will love this Strong’s curriculum because children work well with interactive lessons. The vibrant colors will entice their interest and excitement. My kindy student will have a “ball’ with this resource. They learn best by example! I have a variety of ages in my small but eager to learn Sunday School class and am looking for engaging and insightful and most importantly a Doctrinely Sound curriculum for them. I would love to win this. Thanks to everyone who entered the giveaway. we just did the random drawing and Pamela was the winner! Congratulations. I’m so excited at what i just saw!!!! My kids at church would benefit so much from this curriculum! Love you guys and all you do for the kids! Of course we teachers at our church would love to have this resource for our children’s ministry. We want to be certain that we’re guiding our little ones (and not so little ones) with the Truth of God. My earnest prayer, however, is that the LORD will have his hand on who will truly benefit from this resource, and that they will be the recipients. Thank you for using your talents to develop a curriculum that is engaging and full of the Power and Truth of God. We are a part of a church revitalization at Grace Baptist Church in Detroit, Mi. Currently we have only 30-40 attending church but we know that God will grown the church. I have used Ministry to Children material for many years and have found it to be not only very Biblically solid material, but it is also very child friendly and fun! I highly recommend it to anyone. And we would love to have this new curriculum for our children’s ministry! To God be the Glory. May God continue to bless your ministry and teams for providing Biblical teaching materials to reach children and be save and grow. We are a small baptist congregation here in the Philippines, but have a burdened hearts to the growing population of children who have not known the Lord. I hope and pray to God to provide us materials like this, in order for us to get as many kids to the Lord and nourished them in a biblical way. I would love to use the curriculum. I lead a mutli age class that ranges from ages 4-12. The Strong curriculum would be more than helpful in our children’s ministry. I just love love love the music accompaniment and the curriculum is so colorful and inviting. This curriculum would be such a blessing to our children’s ministry. It’s a fresh and new approach to teaching our children. God bless you for always creating new material. I appreciate the fact that the curriculum is all inclusive, catering to all learning skills and techniques for the children. We are currently doubling up our morning and evening Sunday School lessons, from what I saw, this would be a welcoming resource to our outreach program especially for our primary age group. God continual blessings on your good works. With the age group (8-11) I teach for Sunday School, I believe they would really benefit from this curriculum as it looks to be very interactive and gets them excited to learn more about the Lord and other biblical stories. This would be a great resource for my class. Our church just started our Sunday school program back up because we had a decrease of people. We are on a very fixed income so this curriculum would be a blessing to our church and to our kids. I am Sunday school teaching grades 1-5. Mixed grade level and i feel this would be perfect . My class would benefit from this curriculum . I try to be hands on and get them excited and have fun while learning about the Lord. May the Lord bless you as you choose your winner :) Thank you for the chance. I have a wide range of kids 6-14 with a small class which is unpredictable. I love having all we need right at our fingertips. It looks very adaptable to ages. I love the interactive activities. This would be great for my kids in the Childcare \center that I manage. I am/We are looking for a Bible Based curriculum. I think this one could be it. We are a New Bible Church in Southern , Az……. Lifting up the Name of Jesus! Our Sunday School Program is multi-age……..3- 8. I am very Thankful for this website Ministry to Children. I often browse and use the Free Lessons!! It would be a Blessing to use Strong Kids Curriculum!! Children will love the simplicity of knowing that Jesus has come for them too. Love that it looks adaptable to various ages. Looking to change up our curriculum! Always looking for new ways to reach youth for Christ. We are a small Church in a very small town in NW Iowa. Congregation less than 100 and 16 children ages 2 years to 16 years. I teach the small ones and next year will have 5 in my class ages 3-5 years. Loving children and teaching them that Jesus Loves them because the Bible tells us so. I’m sure the little kids at my church will enjoy this kit! I can’t wait to use it and share it with the other teachers. Tony Kummer (Editor) reviewed & updated this page on : November 24, 2018 at 12:58 pm. All our content is peer reviewed by our readers, simply leave a comment on any post suggest an update.